What was the role of Osama Bin Laden (OBL) in various conflicts involving Islamic militancy in the 1990s? Frequently one has to turn to secondary historical literature discussing that period. It is my hope here to make accessible some jihadi testimony on the 1990s written in Arabic. In this case, we have the testimony of one "Abu Akram Hisham," who was identified in an interview with the magazine al-Risalah as "Hisham Abu Akram" and "Abu Hisham Abu Akram," a member of the Shura council of al-Qa'ida in the Islamic Maghreb (AQIM). In his interview with al-Risalah, Abu Akram says that he initially went to Afghanistan in the early 1990 and received training at a camp that was run by the Services Bureau, and then left for Afghanistan to Sudan and stayed at OBL's guesthouse there from late 1993 until the end of 1995. He then became directly involved in the Algerian jihad as he entered Algeria via the Niger desert. 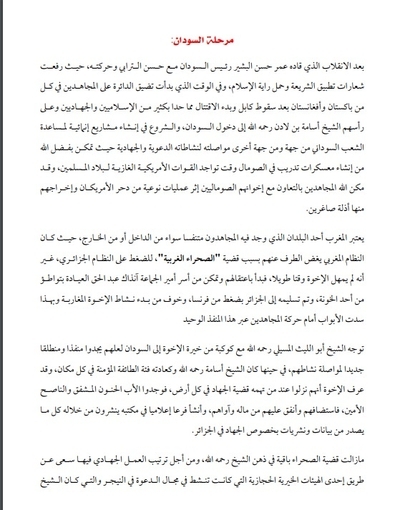 In this testimony published in 2016 CE, Abu Akram wishes to shed light on OBL's role in supporting the Algerian jihad. His motive is to commemorate the memory of OBL as a person who supported causes of Islam and jihad in every place he could do so. One should bear this propagandistic purpose in mind as one analyzes the text. - OBL took an interest in jihad in Algeria following the call for a general strike by the Islamic Salvation Front (FSI) in May 1991 CE. That call for a strike was followed by a series of arrests targeting the FSI leadership. OBL, who at the time was in the Afghanistan-Pakistan area, prepared guest houses for Algerians and covered their expenses to go back to Algeria and participate in the events there. - Interest in jihad in Algeria increased on account of the infighting that developed in Afghanistan after the collapse of the communist/socialist government in April 1992 CE. Further, the Pakistani government had become less tolerant of the mujahideen. The idea of the Greater Sahara as a rear base was explored with scouting at the beginning of 1992 CE. - OBL migrated to Sudan and helped to establish training camps for jihadis to fight the U.S. presence in Somalia in cooperation with local Somali insurgents. OBL also received jihadis who initially had some space for maneuver in the Maghreb region on account of Morocco's own dispute with the Algerian government but later faced a crackdown. - OBL established contact with the Armed Islamic Group (GIA) in the hope of working with it in Algeria, but a major problem was the GIA's demand for an allegiance pledge by all who wanted to join it or work with it. OBL wanted some time to explore the GIA's direction and aims. Envoys were sent to Algeria in 1994-1995 CE and there was interaction with the GIA on the ground. The envoy in 1995 CE was Atiyat Allah al-Libi, who reported back to OBL in late summer 1995 CE on his findings. OBL decided by the end of summer 1995 CE to end any dealings with the GIA, which he clearly regarded as too extreme and problematic to support and work with. 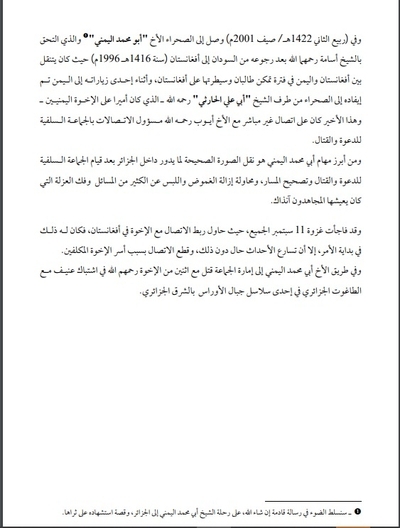 - OBL took an interest in the GIA splinter faction called the Salafi Group for Da'wa and Combat. This faction became the basis for the formation of AQIM. By Abu Akram's own admission in his interview with al-Risalah, the prospects of jihad in Algeria are still dampened because of the actions of GIA, which alienated much of the population. The main positive outcome, in his view, is the spread of jihad over the Greater Sahara. - Abu Abd al-Rahman Amin (Djamal Zitouni): amir of GIA in the period 1994-1996 CE. - Hidayat Rabb al-Alimeen: a book by Zitouni, more fully titled "Hidayat Rabb al-Alimeen fi Tabyin Usul al-Salafiyeen wa Ma Yajib Min al-'Ahad 'Ala al-Mujahideen" (Guidance of the Lord of the Worlds in Making Clear the Principles of the Salafis and What is Obligatory on the Mujahideen from the Pact). As Abu Akram notes, the GIA denoted its 'imara (emirate/command/amirship etc.) as a "general emirate" rather than a particular emirate of war. I will discuss this book's contents further in a subsequent post. 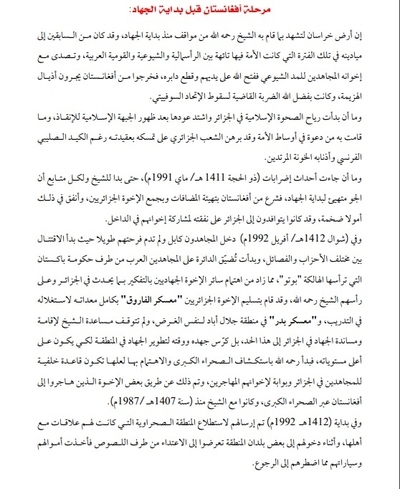 - Abu Obeida al-Banshiri: an al-Qa'ida leader of Egyptian origin who died in 1996 CE. - Bhutto: i.e. Benazir Bhutto. - Khalid Abu al-Abbas: Mokhtar Belmokhtar, an Afghan jihad veteran who has long been involved in the Greater Saharan jihad. Aligned with al-Qa'ida. - Abu Ali al-Harithi: Yemeni al-Qa'ida member killed in 2002 CE. - Muhammad al-Sa'id: Algerian Islamist figure who once aligned himself with GIA. He was killed at some point in the latter half of 1995 CE by GIA. 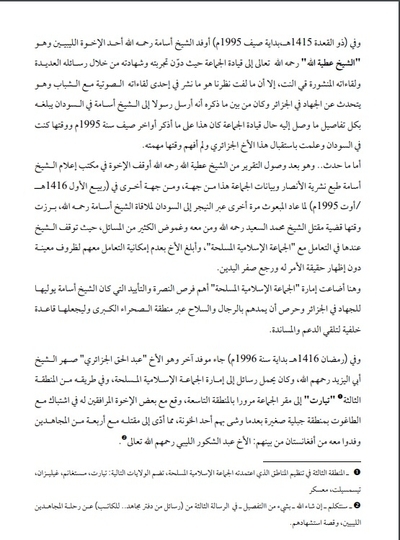 - al-Ansar: a jihadi newsletter that was published in the 1990s in support of the GIA. Below is the text written by Abu Akram. Any parenthetical insertions for clarity are in square brackets. We will try to show our mujahideen brothers in particular and the Muslims in general something small from what we have known from near and from afar concerning the relation of Sheikh Osama (may God have mercy on him) with the brothers in the Islamic Maghreb and in particular the jihad in Algeria. And we have been assisted in gathering its material by some of the brothers, may God reward them best. Discussing the life of the Sheikh al-Imam Abu Abdullah Osama bin Laden (may God have mercy on him) cannot be done justice by this short message, for the life of the sheikh is well-known to all and his virtues are acknowledged by the enemy and friend. And the writers have enriched the Islamic library with discussion of his life and exploits and the poems said about him. And the one who wants to write about the life of the sheikh needs to write volumes to do him justice, for by God he deserves to be mentioned in the record of outstanding figures. And if the Ummah lived in its past through imams who changed the course of history like Salah al-Din and Qutuz, our sheikh- may God have mercy on him- is the leader of the wars today against the Crusaders, Jews and apostates. And God opened to his hands the breaking of the arrogance of America and its tyrants, and its impacts cannot be counted by us. But we wanted to mention his grace upon us in the field of the Islamic Maghreb, because the one who does not thank the people does not thank God, as the predecessors- may God be pleased with them- used to mention each other's exploits and positions. So this Sa'ad bin Ubada- may God be pleased with him- sat with one of the sons of al-Meqdad bin Amro, and said: "I still remember al-Meqdad's position the day of the Battle of Badr, in which the Prophet (SAWS) rejoiced and prayed for good for him, as he said: 'Oh Messenger of God, go forth to what God has shown you, and we are with you and do not say to you as the children of Israel said to Moses: 'Go forth, you and your Lord, and fight: we will sit here.' But go forth you and your Lord, and we are with you as fighters, for by the One who sent you with truth: were you to go to Birk al-Ghimad through us, we would fight alongside you whoso is before it so that you should reach it." "God will send to this Ummah at the beginning of every century someone who will revive for it its religion." So we by God bear witness that he revived for this Ummah its religion, and the religion of the Ummah is jihad as in the words of SAWS: "....until you should return to your religion." The 'ulama have said: the intended religion, return to it is jihad. Yes, the sheikh revived for this Ummah its religion for he spent his time, wealth and all he had to support this religion, for the state of the Ummah from its west to east kept him awake, and he was saddened by the state of the Ummah and the level of weakness and degradation it had reached. So he called in the Ummah: he came forth to jihad, eased its path through his life and wealth, and opened guest houses and camps to train the youth of the Ummah. And he did not seek anything for himself, but rather his concern was to support the religion of God in any land and under any sky, as he was never heard to have said: I did such and such. But rather he always said: the youth arose, and the mujahideen did, and we have incited and the youth have responded. And we really believe that what has been hidden to us is very much, so we ask God- Almighty and Exalted is He- to put all that in the balance of his good deeds, and to gather us with him in the resting place of His mercy with the prophets, the steadfast, martyrs and the just: and those have been good companions. The land of Khorasan indeed bears witness to what the sheikh- may God have mercy on him- undertook from stances since the beginning of the jihad. And he was among those who first headed to its fields in that time in which the Ummah was lost amid capitalism, communism and Arab nationalism. Along with his mujahideen brothers, he resisted the communist expansion, and God gave them victory and cut its root, so they went out from Afghanistan dragging the tails of defeat, and by God's grace it was the decisive blow for the fall of the Soviet Union. Then the wind of the Islamic awakening began in Algeria and its force grew strong after the appearance of the Islamic Salvation Front, and da'wa it undertook in the midst of the Ummah, and the Algerian people showed their adherence to their creed despite the machinations of the French Crusaders and their apostate traitor followers. And no sooner had the events of the strikes of Dhu al-Hijja 1411 AH/May 1991 CE begun than it appeared to the sheikh and to every follower that the atmosphere was ready for the beginning of the jihad, so he began from Afghanistan to prepare the guest houses and bring together the Algerian brothers, and he spent huge sums of money for that. And they were going to Algeria at his expense to participate with their brothers in the interior. And in Shawwal 1412 CE/April 1992 CE, the mujahideen entered Kabul and their joy did not last long as the infighting began between the different parties and factions, and the noose began to be tightened around the necks of the Arab mujahideen by the Pakistani government led by the damned Bhutto. This increased the interest of the rest of the jihadi brothers in thinking about what was happening in Algeria, at the head of whom was the Sheikh, may God have mercy on him. And he handed over to the Algerian brothers the "al-Faruq camp" with all its equipment to be used in training, as well as the "Badr camp" in the Jalalabad area for the same purpose. And the sheikh's aid did not cease to establish and aid the jihad in Algeria up to this point, but rather he consolidated his efforts and time to develop the jihad in the area so that it should be at its highest levels, so he- may God have mercy on him- began to scout the Greater Sahara and take an interest in it, in the hope that it might be a rear base for the mujahideen in Algeria and the gates for their muhajireen brothers. And that was done through some of the brothers who had migrated to Afghanistan through the Greater Sahara, and they had been with the sheikh since 1407 AH/1987 CE. And in the beginning of 1412 AH/1992 CE, they were sent to scout the Sahara area with whose people they had relations, and when they entered some of the localities of the area they were subject to attacks thieves, so their wealth and cars were taken, which compelled them to return. After the coup led by Omar Hassan al-Bashir (Sudan's president) with Hassan al-Turabi and his government, as the slogans were raised to implement Shari'a and carry the banner of Islam, and at the time in which the noose began to be tightened around the neck of the mujahideen in all of Pakistan and Afghanistan after the fall of Kabul and the beginning of the infighting, many of the Islamists and jihadis- at the head of whom was Sheikh Osama bin Laden (may God have mercy on him)- were spurred on to enter Sudan. And he began to establish economic projects to aid the Sudanese people on one hand and on the other, he continued his activities of da'wa and jihad as he managed by God's grace to establish training camps in Somalia at the time the American forces invading the land of the Muslims were present. And God enabled the mujahideen in cooperation with their Somali brothers through special operations to rout the Americans and expel them from it, humiliated and lowly. The Maghreb is considered one of the lands in which the mujahideen found breathing space whether from the inside or outside, as the Maghrebi [Moroccan] regime was turning a blind eye to them on account of the "Western Sahara" issue to pressure the Algerian regime. But it did not ignore the brothers for long, as it began to arrest them and managed to take prisoner the amir of the group then (Abd al-Haqq al-Iyada) through the involvement of one of the traitors, and he was handed over to Algeria through pressure from France and fear that the Maghrebi brothers would commence activities. And thus the doors were closed before the mujahideen movement through this sole opening. Sheikh Abu al-Layth al-Masili (may God have mercy on him) with a group of the best of the brothers headed to Sudan in the hope that they might find a new opening and launching point to continue their activities, at the time Sheikh Osama (may God have mercy on him) and as was his custom a supporter of the believing sect in every place, and the brothers knew that they had come to someone interested in the cause of jihad in every land, so they found the compassionate, caring father and trusted advisor, so he received them and spent from his wealth for them and gave them refuge. And he established a media division in his office publishing through it all that was issued from statements and publications regarding the jihad in Algeria. The case of the Sahara continued to remain on the mind of the sheikh (may God have mercy on him). In order to organize the jihadi work in it, he made efforts through one of the Hejazi charity committees that was operating in the field of da'wa in Niger and which was led by Sheikh Hassan (may God have mercy on him),[i] one of those operating within it. He was summoned by Sheikh Osama and one of the Algerian brothers to Sudan to organize the matter of jihadi activity and mobilization from the Sahara, but Sheikh Hassan did not meet directly with Sheikh Osama (may God have mercy on him), and afterwards he returned to Niger. And in Muharram 1414 AH/summer 1993 CE, Sheikh Osama sent two virtuous brothers- one of them Algerian, the other Libyan- and on their arrival at Niger airport they were subject to interrogation concerning their relations with Sheikh Hassan. But God made them steadfast and brought their enemies to perdition, so they were condemned to prison for a year and a half, and after they got out they returned to Sudan again and continued their activities in coordination with the Algerian brothers, and in this regard Sheikh Osama established a committee concerned with tracking the cause of jihad in Algeria, and striving to assist the mujahideen with different types of weapons and ammunition in coordination with other jihadi groups in the area. So thus was the sheikh- may God have mercy on him- and his endeavor, expenditure and devotion as we reckon him and God is his reckoner and God blessed him. For he produced his plants and made them bear fruit, and by God's grace the Sahara today has brought forth a thorn in the throats of the enemies, demolishing the couches of the Crusaders and their followers from the apostates, and it is a refuge and base in which the mujahideen from the different areas of the Maghreb and Africa can take refuge. The jihad in Algeria arose by God's grace then by the consolidation of the efforts between the brothers from the inside and those coming from Afghanistan, and the sheikh wanted to raise the performance level of the mujahideen in that it was the hope that remained for the Ummah after Afghanistan. So he tried to insert cadres to help the brothers in planning, and among the suggested names was the commander Sheikh Abu Obeida al-Banshiri (may God have mercy on him), but that was not possible for him. And the sheikh- as previously mentioned- tried to support the mujahideen with arms and ammunition, and develop the media activity for the mujahideen by transmitting a broadcast to use it in the realm of making the Ummah aware and inciting them, but God did not allow for that to happen.
. Taking the lesson from what the jihad in Afghanistan came to on account of the lack of a unified command in which those factions and parties squandered the effort of the Ummah and blood of the martyrs, and by God's grace the Taliban emirate rectified this matter.
. The lack of a rear base for the expansion of jihadi activity and external support.
. The group's affirmation in the message Hidayat Rabb al-Alimeen that the group's emirate is a general emirate, and this was among the most dangerous issues in which the group erred and thus spilt blood and shut the doors on all who wanted to support it. But Sheikh Osama (may God have mercy on him) asked the group for more time to be sure and certain of the group regarding its manhaj and aims. In Muharram 1414 AH/summer 1994 CE, an envoy was dispatched from Yemen through Sudan to the brothers in the Sahara, and he was Algerian, and one of those close to Sheikh Hassan (may God have mercy on him), and he was entrusted by Sheikh Osama (may God have mercy on him) with establishing liaison with the group through the Sahara, and he managed to meet the brother Khalid Abu al-Abbas (may God protect him) and his group in Niger and he was informed of his assignment- that is, establishing liaison with the group. And on their entry to Algeria, the brother Khalid raised the matter to the amir of the area there and he was the brother commander Abd al-Baqi al-Aghwati (may God have mercy on him), and they both moved together to the emirate of the group with Abu Abd al-Rahman Amin (may God have mercy on him), and they were entrusted with overseeing the organization of matters with Sheikh Osama (may God have mercy on him). And in Dhu al-Q'ida 1435 AH/beginning of summer 1995 CE, Sheikh Osama (may God have mercy on him) dispatched one of the Libyan brothers (Sheikh Attiyat Allah- may God Almighty have mercy on him) to the leadership of the group as he documented his experience and testimony through a number of his messages and meetings published on the Internet. 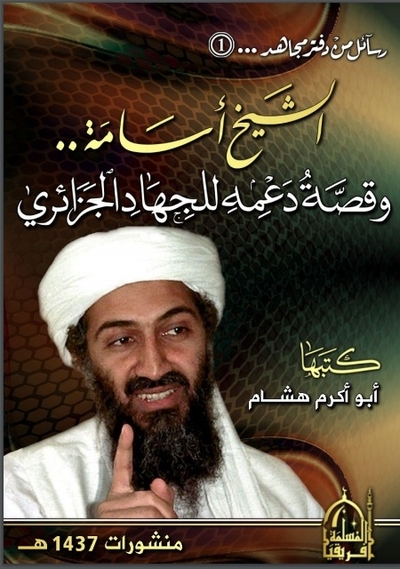 But what is relevant for our attention is that which he published in one of his audio meetings with the youth as he spoke about the jihad in Algeria and there was among what I remember that he sent emissaries to Sheikh Osama in Sudan, informing him of all the details of what the state of the leadership of the group had come to. This was as I recall at the end of the summer of 1995 CE and at the time I was in Sudan and I was aware of the reception of this Algerian brother and I did not understand at the time his mission. 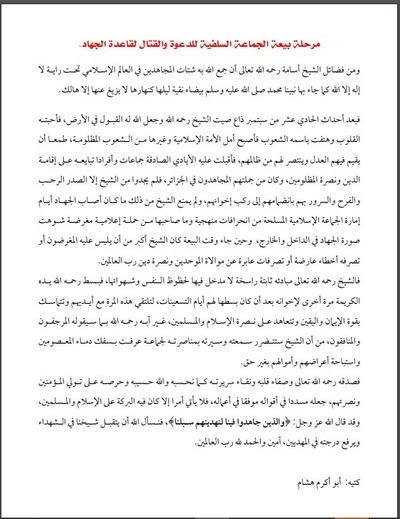 As for what happened, and it was after the arrival of the report from Sheikh Attiyat Allah (may God have mercy on him), the brothers in the Sheikh Osama's media office stopped printing newsletters of al-Ansar and the statements of the group on the one hand, and on the other hand in Rabi' al-Awal 1416 AH/August 1995 CE, the envoy returned again through Niger to Sudan to meet Sheikh Osama (may God have mercy on him). At that time the case of the killing of Sheikh Muhammad al-Sa'id (may God have mercy on him) and whoso was with him and the obscurity of many of the issues became prominent [/came into view/emerged], and the sheikh then ceased to deal with the Armed Islamic Group, and the brother was informed of the lack of possibility of dealing with them for specific circumstances without displaying the truth of the matter to him. And he returned empty-handed. And here the emirate of the Armed Islamic Group lost the most important of the opportunities for support that Sheikh Osama commissioned for the jihad in Algeria and he had been keen to help them in men and arms through the Greater Sahara region and to make it a rear base to receive support and aid. And in Rabi' al-Thani 1422 AH/summer 2001 CE, the brother Abu Muhammad al-Yemeni[iv] arrived to the Sahara and he had joined up with Sheikh Osama- may God have mercy on them both- after he returned from Sudan to Afghanistan in 1416 AH/1996 CE as he was moving between Afghanistan and Yemen at a time in which the Taliban had become enabled and seized control of Afghanistan. And during one of his visits to Yemen he was sent to the Sahara by Sheikh Abu Ali al-Harithi (may God have mercy on him), who was an amir over the Yemeni brothers. And this latter individual was in indirect contact with the brother Ayub (may God have mercy on him), the contacts official in the Salafi Group for Da'wa and Combat. 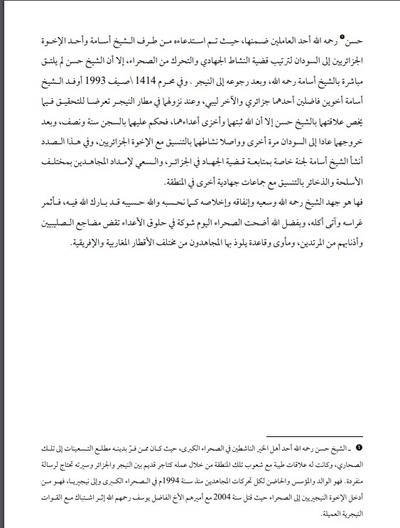 And among the most important tasks of Abu Muhammad al-Yemeni was to convey the true picture of what was happening inside Algeria after the rise of the Salafi Group for Da'wa and Combat and correction of the path, and try to remove obscurity and ambiguity about many of the issues and break the isolation that the mujahideen were living through there. And then the 11 September raid surprised all, as he tried to establish the contact with the brothers in Afghanistan, for that was for him in the beginning of the matter, but the rapid progression of events prevented that, and the contact was cut because the entrusted brothers were taken prisoner. And on the path of the brother Abu Muhammad al-Yemeni to the emirate of the group, he was killed along with two of the brothers (may God have mercy on them) in a violent clash with the Algerian Taghut in one of the series of the Atlas Mountains in eastern Algeria. And among the virtues of Sheikh Osama (may God Almighty have mercy on him) was that through him God brought together the various mujahideen in the Islamic world under the banner of there is no deity but God as our Prophet Muhammad (SAWS), pure white whose night is like its day, with only a damned person turning away from it. For after the events of 11 September, the renown of the sheikh (may God have mercy on him) spread and God made for him acceptance in the land, for hearts loved him and peoples shouted in his name so he became the hope of the Islamic Ummah and others besides it from the oppressed peoples, in the hope he would establish justice among them and give them victory over their oppressor. So the honest hands came forth to him in groups and individuals, pledging allegiance to him to establish the religion and support the oppressed, and among them were the mujahideen in Algeria. For they did not find from the sheikh anything except the open heart, joy and delight in them through their joining the convoy of their brothers, and the sheikh was not prevented from that by what had afflicted the jihad in the days of the emirate of the Armed Islamic Group from deviations in manhaj and what accompanied that from a biased media campaign that distorted the picture of the jihad in the inside and outside. And when the time of allegiance came, the sheikh was above being deceived by tendentious types or being diverted by accidental mistakes or incidental actions from the issue of loyalty to the believers and supporting the religion of the Lord of the Worlds. For the sheikh (may God Almighty have mercy on him) was firm in his principles with no entry into them for the vicissitudes of life and its desires, so he- may God have mercy on him) extended his noble hand to his brothers again after having extended it to them in the 1990s, in order to meet this time with their hands and hold together by the force of faith and certainty and pledge to each other to support Islam and Muslims. He (may God have mercy on him) was not concerned with what the murjifun and hypocrites would say about the sheikh's reputation and life being harmed by his support for a group known for shedding the blood of those who were sacrosanct and making their property and wealth fair game without right. So the honesty of him (may God Almighty have mercy on him) and purity of his heart and purity of his conscience as we reckon him and God is his reckoner and his keenness to be loyal to the believers and support them made him on the right path in his words and successful in his deeds, for he would not undertake anything unless there was blessing for Islam and Muslims in it. And God- Almighty and Exalted is He- has said: "And those who have waged jihad for Us, We will surely guide them on Our paths." So we as God to accept our sheikh among the martyrs and to raise his rank among those guided. Amen and praise be to God, the Lord of the Worlds. Written by Abu Akram Hisham. [i] Sheikh Hassan (may God have mercy on him) was one of the Ahl al-Khayr working in the Greater Sahara, as he was among those who fled with his religion at the outset of the 1990s to those Sahrawi areas and he had good relations with the peoples of that area through his work as an old businessman between Niger and Algeria and his biography needs a separate message. For he is the father and founder and nurse for all the mujahideen movements since 1994 CE in the Greater Sahara and to Nigeria, for he is the one who brought the Nigerian brothers into the Sahara, as he was killed in 2004 CE with their amir the distinguished brother Yusuf (may God have mercy on him) following a clash with the collaborationist Nigerien forces. [ii] The Third Region in the organization of the regions that the Armed Islamic Group adopted, including the following provinces: Tiyaret, Mostaganem, Ghilizan, Tissemsilt, Mascara. 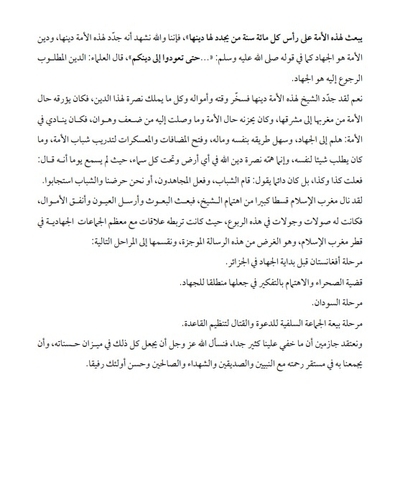 [iii] We will speak God willing in some details in the third message of "Messages from the Notebook of a Mujahid..." about the journey of the Libyan mujahideen and the story of their martyrdom. [iv] We will shed light in a coming message (God willing) on the journey of Sheikh Abu Muhammad al-Yemeni to Algeria, and the story of his martyrdom on its soil.